Perfect for birthday parties, school functions, or office celebrations, this clear plastic hinged cupcake / muffin container can hold twelve 1 oz. cupcakes or mini muffins! 12REG A great way to sell cupcakes in-house, to pre-package them for customers to take with them, or you can use it to bring cupcakes to an event and sell them from the same container. 24MINI Protect the frosting and decorations on your cupcakes with this 24 compartment mini cupcake container! 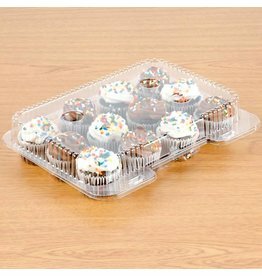 24REG Perfect for birthday parties, school functions, or office celebrations, this 24 clear cupcake / muffin takeout container can hold up to 24 cupcakes or muffins! 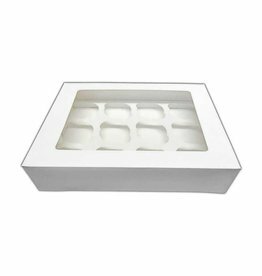 This paperboard cup cake insert holds 12 cupcakes and keeps your baked goods separated and safe during transportation.